With the Dimmer, classic electrical installations such as ceiling and floor lamps can be integrated into the Z-Wave network and dimmed. Whether brightly lit or pleasantly dampened - with the flush-mounted radio module, each switch is smart and the light adapts to your needs. Ceiling fans can also be regulated continuously. With the Dimmer, you can integrate various switchable and dimmable electrical installations such as lighting or ceiling fans into the Z-Wave network. 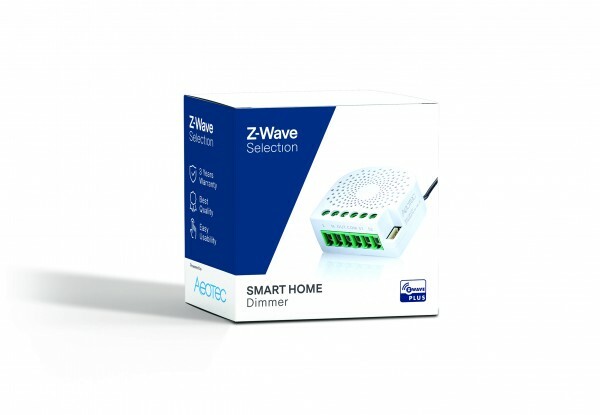 This makes it possible to switch the connected lighting both wirelessly via Z-Wave and locally using the existing wall switch and dimming. The Dimmer automatically adapts to the type of lighting that is connected so that it can be used in combination with different light sources (LED, dimmable LED, CFL, fluorescent and incandescent lamps, halogen lamps). In combination with the appropriate bypass, LEDs and CFLs with a low power of less than 20W can also be dimmed. In addition, the Dimmer switches ceiling fans up to 100W and controls their speed. The flush-mounted module works with every series of switches and every design, provided there is enough space in the junction box for installation. In large 65 mm deep boxes this should be the case regularly. In smaller boxes (for example 45 mm) the possibility of use depends on the required depth of the conventional switch as well as on the space requirement of the possibly also in-the-box electrical connectors. The compact wireless module is placed in a wall socket directly behind the conventional switch and transforms there virtually every standard lighting installations into a smart installation within a Z-Wave based systems.